Have you ever seen the guys at the gym who have jacked upper bodies and bulging quads, but twigs below the knees? It’s clear they skimp on the calves exercises in their workouts. It can be easy to make these smaller muscles an afterthought, but strong calves don’t only help to balance out your appearance, they’re also key to gaining power and explosiveness both inside and outside the gym. “Your calf muscles help propel you forward and up in explosive movements,” says Cody Braun, Beachbody fitness expert. This makes them very useful for sprinting and plyometrics, and any activity that requires leg propulsion or foot stabilization upon landing, like cycling, running, volleyball, or basketball. Tight calf muscles can limit your ankle mobility and potentially increase the likelihood of injuries like shin splints, plantar fasciitis, or Achilles tendonitis. That’s why it’s crucial to regularly train your calves, Braun says. To help you get started, we compiled a list of the best exercises and stretches for a comprehensive calves workout that can be done anywhere, even at home. “The two main muscles you’re trying to build when doing calf exercises are the soleus and the gastrocnemius,” Braun says. The gastrocnemius is the main muscle you see when looking at someone’s calves — it will be thick and well-defined if it’s highly developed. The soleus, in contrast, isn’t outwardly visible — it’s situated deep beneath the gastrocnemius. Both muscles work together to help flex your foot, but only the gastrocnemius plays a role in knee flexion (bending your knee). Though the gastrocnemius is primarily responsible for the outward appearance and size of your calves, it’s important to engage and exercise both parts of the muscles, since each has a unique function. “The gastrocnemius contributes to jumping, acceleration, and explosive speed and power,” says William P. Kelley, C.S.C.S., ACT, while the soleus contributes to walking and running endurance. That’s because the soleus has a very high density of Type 1, or “slow twitch,” muscle fibers, he explains. Type 1 muscle fibers have slow contraction times and a high resistance to fatigue, which is helpful since your legs get a lot of action carrying your body from once place to another. You probably know someone who has massive, sharply defined calf muscles, yet rarely exercises. Meanwhile, you’ve been training your calves three times a week and still only see minimal results. What gives? “Genetics play a role in your muscle makeup and size due to the allocation of Type I and Type II muscle fibers,” Kelley explains. While Type I fibers are more resistant to fatigue, they tend to have a lower growth potential than Type II, “fast twitch,” muscle fibers. Everyone has a different percentage of Type I and Type II muscle fibers, meaning “someone with a genetic predisposition to Type II fibers may have a greater growth potential than someone who is more Type I dominant,” Kelley says. If you weren’t born with naturally thick, shapely calves, don’t stress. “[Genetic makeup] does not prevent anyone from increasing calf strength and size,” Braun says, it might just require more work. The right workout routine, diet, and recovery plan can help you build stronger, more athletic calves no matter where you’re starting from. Below are eight simple, but effective moves to help strengthen and stretch your calves. The best part? Like all Beachbody On Demand workouts, these calf exercises are easy to do at home. All you need is a jump rope, a pair of dumbbells, and a bench or chair. Try incorporating these calf exercises into your workouts a couple times a week, Kelley says. But if you adhere to a demanding cardio routine, this amount may vary. “For example, a distance runner may need to resistance train calves less frequently to avoid overtraining,” he explains. 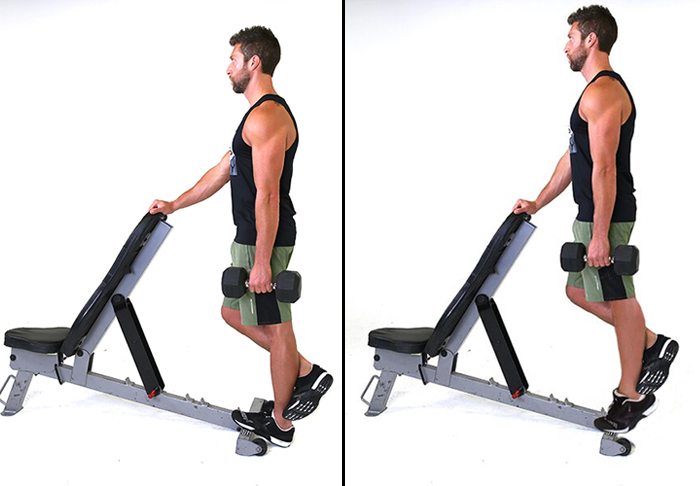 Benefits: This variation on a traditional farmer’s walk is excellent for functional calf strengthening and balance, Kelley says. “Due to the plantar flexion hold, this move is a great finisher to exhaust your calf muscles,” Braun adds. 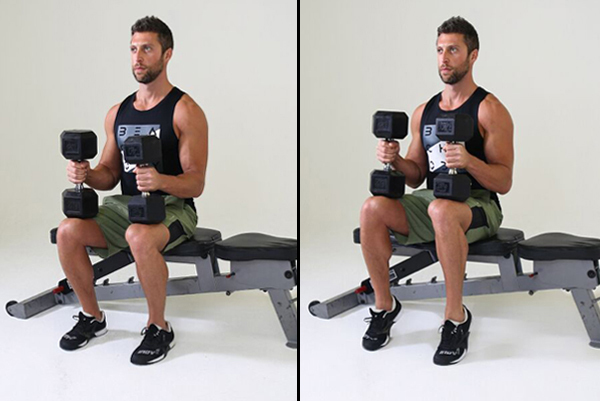 Hold a dumbbell in each hand with your feet hip-width apart. Keeping your shoulders down and your core engaged, lift your heels so you’re standing on your toes. Without letting your heels touch the ground, walk forward on your toes. Benefits: This is a good endurance exercise for your calves, and also helps improve total-body coordination, Kelley says. Holding the handles of a jump rope in each hand, jump with both feet as your turn the rope. Keep your core engaged and your shoulders lowered. Benefits: This plyometric gets power from the calf muscles during the ascension part of the jump, as well as stabilization during the landing, Braun says. 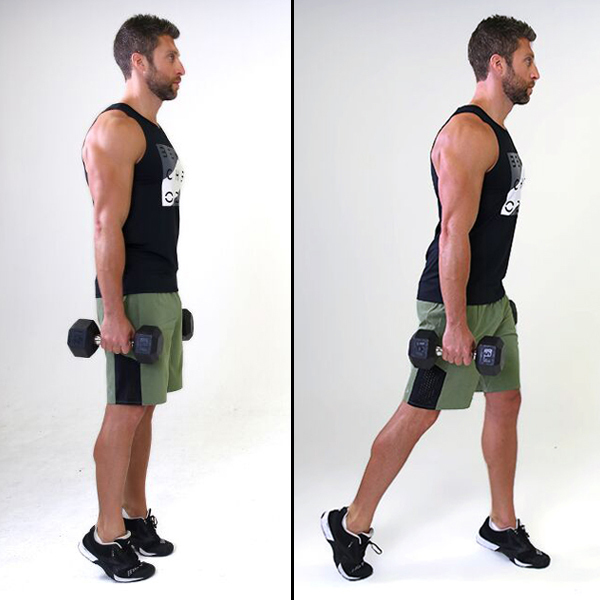 Holding a dumbbell in each hand, stand tall with your feet shoulder-width apart. Push your hips back to lower down into a squat position, until your thighs are parallel with the ground. In one explosive movement, straighten your legs to come out of the squat position and jump off the ground. 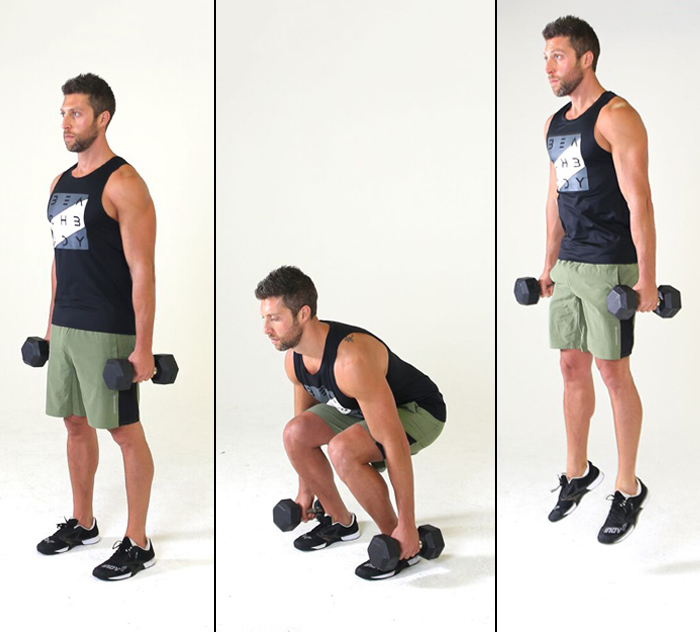 Land softly with bent knees as you lower back into the squat position. Repeat. Benefits: This classic yoga pose is a great calf stretch. To deepen the stretch, bend one knee and then the other to peddle the feet. Begin in a tabletop position with your hands planted on the ground beneath your shoulders and your knees below your hips. Pressing firmly into your palms, tuck your toes, lift your knees off the ground, and slowly extend your hips upward. Without locking your knees, carefully straighten your legs until your body creates a triangle shape with the ground. Remember to engage your core as you continue to lengthen your spine and lift your hips as high as possible. Benefits: This is a good stretch to target your gastrocnemius and simultaneously improve ankle flexibility, Braun says. Standing arm’s distance away from a wall, step one foot back and slightly bend your front knee. Lean forward to push your hands against the wall, and press your back heel down into the ground for a deep stretch. Make sure your leg is straight. To isolate the soleus, try a variation with your back leg slightly bent. Benefits: Another wall stretch variation, this hits your gastrocnemius and can also help relieve tension in your Achilles tendon. “It also doubles as a good stretch for the plantar fascia,” Kelley adds, which is a common cause of heel pain. Standing in front of a wall, put one foot forward so your heel is on the ground and the ball of your foot is against the wall. Resting your hands on the wall, gently straighten your front leg and lean forward until you feel a deep stretch in your calf. When it comes to strengthening your calves, exercise is only one part of the equation. “Daily calf stretching is a good habit to get into for greater calf extensibility, which will help with ankle mobility and more complex leg exercises, such as the squat,” Kelley says. If tight calf muscles are limiting your ankle mobility, Braun recommends foam rolling in addition to stretching. Aim to do both — foam rolling first, then stretching — after a leg-intensive workout; this will help relieve tension in your muscles and set you up for a quicker recovery. As with any muscle building goal, smart nutrition is critical. So if you’re trying to build bigger calf muscles, you need to pay attention to what you eat. “The proper amount of protein and amino acids to build muscle, carbs for energy, and supplementation with creatine and leucine can all be beneficial in calf muscle growth,” Kelley says. Focus on eating a balanced diet of lean protein (like chicken and fish), high-quality carbs (like fruit, veggies, and whole grains), and healthy fats (like avocado, salmon, and olive oil). Stay on top of your hydration, too — as a general rule, aim to drink half your bodyweight in pounds in ounces each day. Supplementation can also help you maximize your calf-building results. If you want an extra boost of energy before your calf workout, try Beachbody Performance Energize, which has beta-alanine and quercetin to delay exercise-induced muscle fatigue and help you push through those last few sets. And don’t forget to refuel after your workout with a post-workout shake like Beachbody Performance Recover, which is designed to help facilitate protein synthesis (muscle growth) and speed your recovery. It contains 20 grams of high-quality protein to feed your muscles, plus pomegranate extract to help reduce muscle soreness.